The level of intra-species genetic variation in Entamoeba histolytica, Entamoeba dispar and Entamoeba moshkovskii populations in a localized geographic area, like Puducherry, India, remains unknown. In the present study the existence of genetic variation in the nested multiplex polymerase chain reaction (NM-PCR) amplified region of the 16S-like ribosomal RNA genes of E. histolytica, E. dispar and E. moshkovskii was investigated by riboprinting and single strand conformation polymorphism (SSCP) analysis. We found that 70 stool specimens were positive for E. histolytica, 171 stool specimens were positive for E. dispar, and 37 stool specimens were positive for E. moshkovskii by NM-PCR. Ninety liver abscess pus specimens, 21 urine specimens, and 8 saliva specimens were positive for E. histolytica by NM-PCR. Riboprinting analysis detected a mutation in the PCR product of only one E. histolytica isolate from a stool specimen. However, SSCP analysis detected mutations in the PCR products of five E. histolytica isolates and three E. moshkovskii isolates from stool specimens, and one E. histolytica isolate from a saliva specimen. The mutations detected by riboprinting and SSCP analysis were confirmed by sequencing. All the nucleotide sequences showing mutations in this study have already been deposited into the NCBI GenBank database under accession numbers [GenBank: EF682200 to GenBank: EF682208]. The present study has revealed the subsistence of mutations in the ribosomal RNA genes of E. histolytica and E. moshkovskii, which points towards the existence of intra-species genetic variation in E. histolytica and E. moshkovskii isolates infecting humans. The protozoan parasite Entamoeba histolytica is estimated to infect 50 million people and cause 40,000 to 100,000 deaths annually, making it the second largest cause of mortality from infection with parasitic protozoa after malaria . Although the first description of amoebiasis was more than a century ago , there is still uncertainty as to why symptoms of the disease appear only in 10% of those infected with E. histolytica while majority remains asymptomatic . There have been several suggestions regarding the factors that may contribute to the outcome of amoebic infection in a susceptible host, which include a range of virulence levels among the E. histolytica strains and variability in host immunity against amoebic invasion. While the variability of human immunity against amoebic infection is not well understood, the existence of genetic variation in E. histolytica has been studied in depth recently [4–17]. These studies have identified genetic variation in protein-coding sequences of E. histolytica, such as those for the serine-rich E. histolytica protein [10–15] and chitinase [8, 11, 12], as well as non-protein-coding regions such as the ribosomal RNA (rRNA) genes [4, 5, 7] and loci 1–2 and 5–6 [11, 12, 16, 17]. In addition, the existence of genetic variation in non-protein-coding loci 1–2 and 5–6 , as well as protein-coding chitinase gene of E. dispar has been reported recently . These genetic variation studies appear to be promising in investigating the molecular epidemiology of amoebiasis. The existence of significant genetic variation among E. histolytica isolates collected from a wide geographical range, including Mexico, Bangladesh, India, Venezuela, South Africa, the Philippines, and Georgia, has already been demonstrated [8, 9, 13, 14]. However, whether intra-species genetic variation also exists in E. histolytica, Entamoeba dispar and Entamoeba moshkovskii from a population in a restricted geographic area like Puducherry, India, still remains unknown. The rRNAs, especially the 16S rRNA, have been widely used for studying genetic variation because of their conservative nature and universal distribution . In the present study an attempt has been made to study genetic variation in regions of the 16S-like rRNA gene of E. histolytica, E. dispar and E. moshkovskii using riboprinting and single strand conformation polymorphism (SSCP) analysis followed by confirmation by nucleotide sequencing. The study was conducted at the Jawaharlal Institute of Postgraduate Medical Education and Research (JIPMER) hospital, Puducherry, India, during the period from July 2004 to July 2006. Informed consent was obtained from the patients. The study was approved by the Institute Human Ethics Committee (JIPMER, Puducherry, India). Fresh unpreserved stool samples from 202 patients with complaints of gastrointestinal discomfort and positive for E. histolytica, E. dispar, or E. moshkovskii by microscopy or culture were collected in sterile capped containers and stored at -20°C until used. The liver abscess pus aspiration was performed only for clinical purposes, as judged necessary by the clinicians for the patient care and not for the purpose of this study. The liver abscess pus was obtained under ultrasound guidance from 112 amoebic liver abscess (ALA) patients and stored at -20°C in a sterile container until used. A urine specimen was collected from 53 ALA patients. Ten millilitres of urine were collected in a sterile container using aseptic techniques and stored at -20°C until used. A saliva specimen was collected from 28 ALA patients. Five millilitres of saliva were collected in a sterile container using aseptic techniques and stored at 4°C until used. The extraction of Entamoeba genomic DNA from stool, liver abscess pus, urine, and saliva specimens was performed as per the method described previously [21–23]. Based on the sequences of the 16S-like rRNA gene of E. histolytica, E. dispar and E. moshkovskii, nested sets of primers (designated E-1/E-2, EH-1/EH-2, ED-1/ED-2 and Mos-1/Mos-2) were used as described previously . E. histolytica HM-1:IMSS, E. dispar SAW760, and E. moshkovskii Laredo were the standard strains used as positive controls in the present study. The lyophilized DNA of these strains was generously gifted by Dr. C. Graham Clark from the London School of Hygiene and Tropical Medicine, London, UK. The PCR mix composition was as described previously . For genus specific and species specific PCR, the reaction volume of 25 μl was comprised of 2.5 μl of 10× PCR buffer (Biogene), 2.0 μl of 25 mM MgCl2 (Bangalore genei), 0.75 μl of deoxyribo-nucleotide triphosphate mix (10 mM each dNTP, Biogene), 0.3 μl (5 IU/μl) of Taq polymerase (Biogene), 0.25 μM primers (IDT) and 2.0 μl of template DNA. Amplification was performed in an Eppendorf Thermal cycler [Master cycler gradient]. The PCR mix composition was the same as described above for liver abscess pus PCR, except that 1.0 μl of 25 mM MgCl2 and 2.5 μl of template DNA was added. The PCR mix composition was the same as described above for liver abscess pus PCR, except that 1.0 μl of 25 mM MgCl2 was added. The PCR cycle conditions were as described previously . Restriction enzymes were used to generate comparative riboprints. The restriction enzymes were selected for the 439 bp, 553 bp and 174 bp PCR product of 16S-like rRNA gene of E. histolytica, E. moshkovskii and E. dispar, respectively, using the online software "NEB cutter V2.0" http://tools.neb.com/NEBcutter2/index.php. 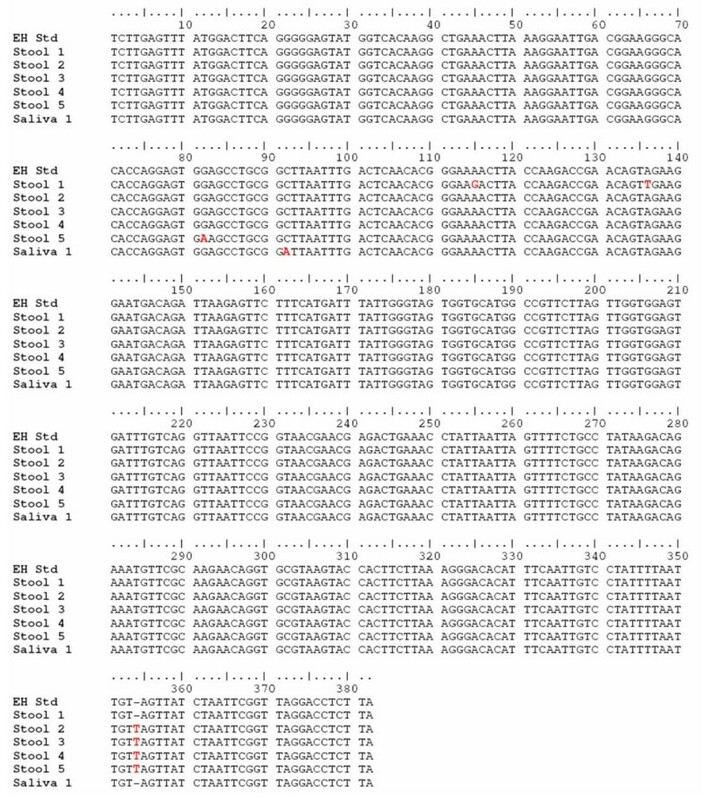 The restriction enzymes used are shown in Table 1. 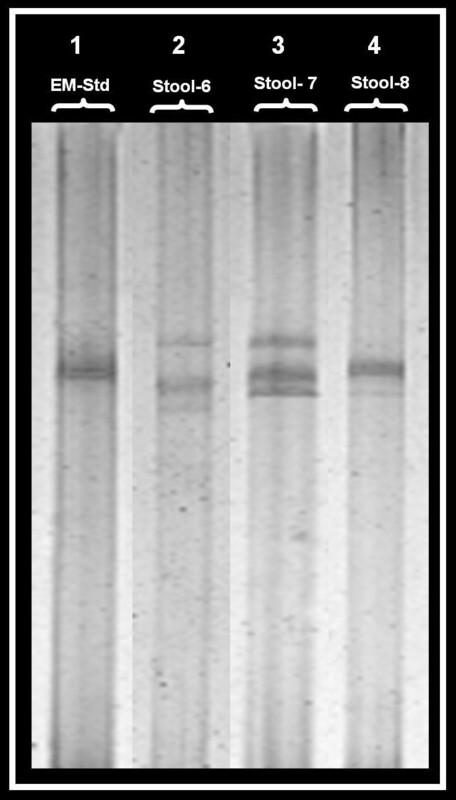 In a 25 μl reaction mix, 15 μl of nested PCR product was digested with 2.5 units of each restriction enzyme in separate 0.2 ml tubes. The incubation period was for 16 hrs at 37°C except for the restriction enzymes Taq I and Mse I where the incubation temperature was 65°C. Twenty microlitres of the restriction enzyme digested PCR product was separated by electrophoresis through a 2.5% agarose gel (Agarose Low EEO, Bangalore genie products, Bangalore, India) containing ethidium bromide in 0.5 × Tris-acetate-EDTA (TAE) buffer at 120 V for 45 min and was visualized under UV light. In the present study 6% and 9% SSCP gels were used. Six percent SSCP gels were used for mutation detection in the 439 bp and 553 bp PCR products of E. histolytica and E. moshkovskii, respectively. A nine percent SSCP gel was used for mutation detection in the 174 bp PCR product of E. dispar. Two microlitres of the nested PCR product was diluted into 20 μl formamide dye mix in a 0.2 ml microfuge tube. A similar aliquot was diluted into 20 μl of gel loading dye. The formamide containing sample was boiled for 6 minutes in a water bath, and then the tube was plunged directly into ice for 10 minutes. The wells of the polyacrylamide gel were washed with 1× TAE electrophoresis buffer. 4 μl of denatured DNA (DNA boiled with formamide dye mix) was loaded into the well of polyacrylamide gel. Two microlitres of non-denatured DNA (DNA with gel loading dye) was loaded into another well. Approximately 6–7 V/cm (~110 V [and 16 mA] for 18 × 14-cm gel) was applied to the gel for 16 hrs at a temperature of 20–25°C in an air conditioned room. On completion of the electrophoresis, the gel was silver stained. Silver staining for nucleic acid was performed as per the method described previously . The gel was documented using a densitometer (Biorad) and the results analyzed using "Quantity One" software (Biorad). For long term storage the gel was kept in 10% glycerol. PCR products of 16S-like rRNA genes of E. histolytica, E. dispar and E. moshkovskii showing mutation by riboprinting or SSCP analysis, were sequenced on a ABI3730XL sequencer (Macrogen, Seoul, South Korea) using species specific primers. The nucleotide sequences were edited with reference to chromatographs using Chromas (Version 1.62) software and aligned using BioEdit (version 7). The nucleotide sequences showing mutations in this study have been deposited into the NCBI GenBank database under accession numbers EF682200–EF682208] (Table 2). Seventy stool specimens were positive for the 439 bp PCR product of E. histolytica, 171 stool specimens were positive for the 174 bp PCR product of E. dispar, and 37 stool specimens were positive for the 553 bp PCR product of E. moshkovskii. Ninety liver abscess pus specimens were positive for the 439 bp PCR product of E. histolytica. Twenty one urine specimens were positive for the 439 bp PCR product of E. histolytica. Eight saliva specimens were positive for the 439 bp PCR product of E. histolytica. No intra-species variation in restriction fragment length polymorphism (RFLP) patterns for any restriction enzyme was observed, except for the N1aIV RFLP pattern of the E. histolytica specific 439 bp PCR product from one stool specimen (Stool- 5). Normal RFLP digestion pattern for the 174 bp, 439 bp, and 553 bp PCR product of E. dispar, E. histolytica and E. moshkovskii respectively with various restriction enzymes are shown in figure 1. Normal RFLP digestion pattern for 174 bp, 439 bp, and 553 bp PCR products of E. dispar , E. histolytica and E. moshkovskii respectively with various restriction enzymes. Lane-1 to 4 normal riboprints for E. dispar (ED); Lane-5 to 11 normal riboprints for E. histolytica (EH); Lane-12 to 19 normal riboprints for E. moshkovskii (EM). Five out of 70 E. histolytica specific 439 bp PCR products from stool specimens, one out of 8 E. histolytica specific 439 bp PCR products from saliva specimens, and three out of 37 E. moshkovskii specific 553 bp PCR products from stool specimens showed an altered SSCP profile (i.e. a mobility shift in the acrylamide gel) suggestive of a mutation (Figure 2 and Figure 3). SSCP analysis showing altered profile (mobility shift) for the 439 bp PCR product of E. histolytica . Lane-1 is for E. histolytica standard DNA (EH-Std); Lane-2, 3, 4, 5, and 6 are for E. histolytica DNA from stool specimens showing an altered profile; Lane-7 is for E. histolytica DNA from a saliva specimen showing an altered profile. SSCP analysis showing altered profile (mobility shift) for the 553 bp PCR product of E. moshkovskii . Lane-1 is for E. moshkovskii standard DNA (EM-Std); Lane-2, 3, and 4 are for E. moshkovskii DNA from stool specimens showing an altered profile. None of the 171 E. dispar specific 174 bp PCR products from stool specimens, 90 E. histolytica specific 439 bp PCR products from liver abscess pus specimens, or 21 E. histolytica specific 439 bp PCR products from urine specimens showed an altered SSCP profile suggestive of a mutation. The E. histolytica and E. moshkovskii isolates showing mutations by PCR-SSCP analysis are summarized in table 2. All four E. histolytica specific 439 bp PCR products from stool specimens (Stool- 1, 2, 3, and 4) showing a mutation by SSCP analysis and the E. histolytica specific 439 bp PCR product from stool specimen showing mutation by both SSCP and riboprinting analysis (Stool- 5), were confirmed by nucleotide sequencing. 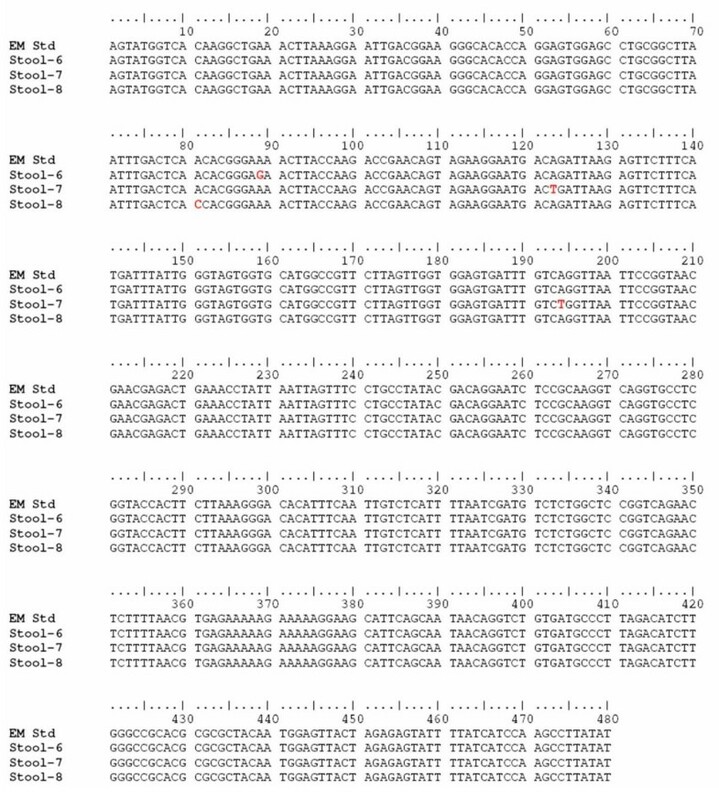 The multiple sequence alignment of these sequencing results and the standard strain E. histolytica HM-1:IMSS is depicted in figure 4. The comparative electropherogram showing the mutant (Stool- 1, 2, 3, 4, and 5) and normal control (E. histolytica HM-1:IMSS) 16S-like rRNA genes is shown in figure 5. Multiple sequence alignment of E. histolytica specific 439 bp PCR products from clinical specimens (Stool-1 to 5 and Saliva-1) and the standard strain E. histolytica HM-1:IMSS (EH-Std). The sequence variations are highlighted in red. Electropherogram showing the mutant (Stool-1 to 5) and normal control E. histolytica HM-1:IMSS (EH-Std) 16S-like rRNA genes. Chromatogram showing the sequence variation is indicated by an arrow. The sequencing revealed substitution of A by G and substitution of A by T (A), insertion of T (B), insertion of T (C), insertion of T (D), and substitution of G by A and insertion of T (E). All three E. moshkovskii PCR products showing mutation by SSCP analysis (Stool- 6, 7, and 8) were confirmed by nucleotide sequencing. The multiple sequence alignment of these sequences and the standard strain E. moshkovskii Laredo is depicted in figure 6. The comparative electropherogram showing the mutant (Stool- 6, 7, and 8) and normal control (E. moshkovskii Laredo) 16S-like rRNA genes is shown in figure 7. Multiple sequence alignment of the E. moshkovskii specific 553 bp PCR products from stool specimens (Stool-6 to 8) and the standard strain E. moshkovskii Laredo (EM-Std). The sequence variations are highlighted in red. 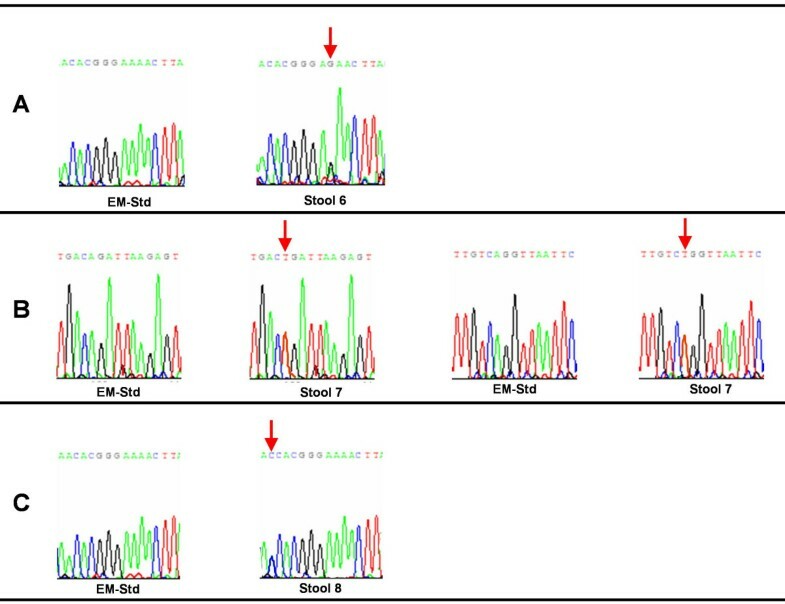 The one E. histolytica PCR product from a saliva specimen showing mutation by SSCP analysis was also confirmed by sequencing. The multiple sequence alignment of the results from this saliva specimen and the standard strain E. histolytica HM-1:IMSS is depicted in figure 4. The comparative electropherogram showing the mutant (Saliva-1) and normal control (E. histolytica HM-1:IMSS) is shown in figure 8. Mutations and other polymorphisms in genes, gene systems, or whole genomes may play an important role in Entamobea. DNA sequencing is considered the gold standard for identifying such mutations. Nevertheless, DNA sequencing method is cumbersome and costly when large numbers of samples need to be rapidly analyzed. The method, therefore, is not always suitable for use in epidemiological studies. In the present study, PCR products of 16S-like rRNA gene of E. histolytica, E. moshkovskii and E. dispar were subjected to screening for mutation by riboprinting and SSCP analysis. These products were of a relatively small sizes, 553 bp for E. moshkovskii, 439 bp for E. histolytica and 174 bp for E. dispar, and were found to be particularly suitable for SSCP analysis. Riboprinting analysis detected a mutation in only one of the E. histolytica samples, from a stool specimen (Stool- 5); the alteration in the RFLP pattern (i.e. 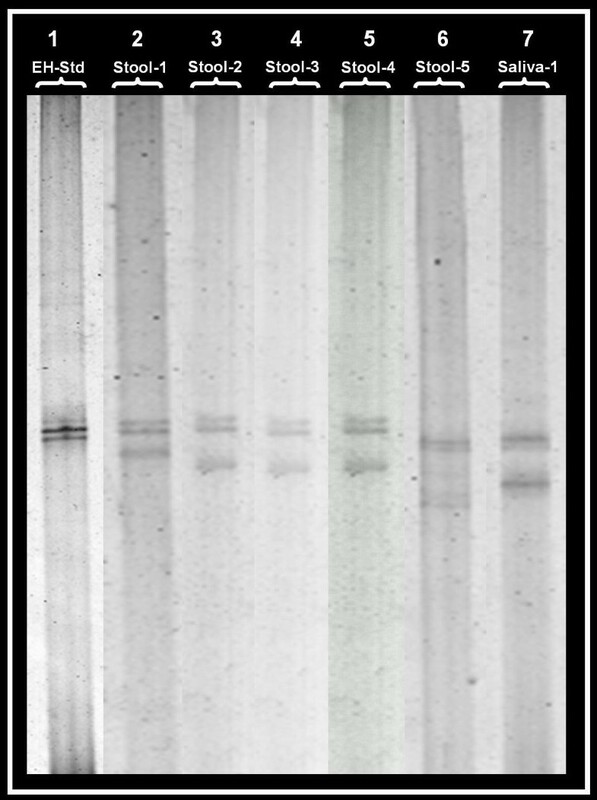 the PCR product remained undigested) was due to substitution of G by A in the recognition site of N1aIV. The inability of riboprinting to detect mutations in a majority of Entamoeba isolates is due to the limitation that RFLP detects mutation only when they occur in restriction endonuclease cut sites. However, SSCP analysis detected mutation in a total of five E. histolytica and three E. moshkovskii isolates from stool and one E. histolytica isolate from saliva. This may be attributed to the ability of SSCP, unlike RFLP, to detect any mutation in a DNA sequence. The SSCP analysis results that were suggestive of mutations were reproducible (i.e. SSCP analysis showed identical profiles in three separate experiments). In this study none of the 171 E. dispar isolates showed characteristics suggestive of mutation by SSCP analysis, perhaps due to the screening of only a 174 bp region of the gene. The chances of finding a mutation in such a small region is less than in larger regions studied for the other two species. Although it was observed that riboprinting was useful for screening a large number of samples, especially when looking for a specific single nucleotide polymorphism, the method has some inherent disadvantages. In this method, a large amount of amplicon (15 μl) is needed for digestion with each of several enzymes, and each clinical sample ends up being electrophoresed on several gels, making it a very laborious and time consuming procedure. SSCP analysis, on the other hand, was found to be simple and convenient in the present study. The results were obtained from only 2 μl of PCR product on a single SSCP gel, which in the long run turned out to be much more economical. The total time needed for PCR-SSCP was less than 24 hours. The SSCP technique developed and evaluated in our laboratory provides us with a rapid tool for detecting mutations in Entamoeba. This method could conveniently supplement other methods of mutation detection analysis on large-scale. The limitation of SSCP, although minor, is that it detects the occurrence of single base mutations in a segment of DNA but does not give any information on the type or location of the base changes, which have to be confirmed by nucleotide sequencing. In the present study, the results showed that SSCP analysis was able to detect even single nucleotide differences (Figure 5, Figure 7, and Figure 8). Nucleotide sequences were verified three times by sequencing of products of different PCR reaction from the same source of DNA to rule out any discrepancy due to sequencing errors. 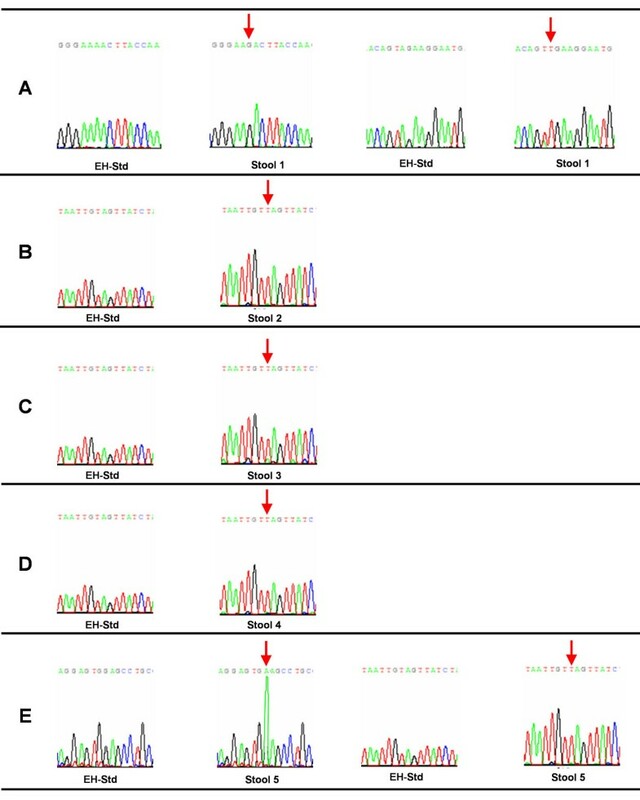 The sequencing analysis identified four new E. histolytica genotypes and three new E. moshkovskii genotypes (Figure 4 and Figure 6). Recently, a report from Bangladesh  studied clinical specimens using six tRNA-linked STR loci, and detected 85 genotypes in 111 unrelated samples. Another report from Bangladesh  also studied clinical samples but used a nested PCR-RFLP of the SREHP gene. Twenty five genotypes among 42 intestinal isolates and 9 genotypes among 12 ALA samples were found. Out of 9 genotypes from liver abscess samples, 8 were unique to the ALA samples investigated. In our study no unique genotypes among any of the liver abscess samples and urine samples from ALA cases were found, but out of 5 E. histolytica genotypes from stool samples 4 were unique to the stool samples investigated. In addition, our study also detected one unique E. histolytica genotype from a saliva sample from an ALA case and three new E. moshkovskii genotypes from stool samples. Clark and Diamond  combined results of both PCR-RFLP of SREHP and amplification of the SSG locus to report 16 different genotypes among 18 isolates of E. histolytica from varied geographical locations. Haghighi et al. reported a total of 53 different genotypes among 63 isolates of E. histolytica, mostly from Japan and Thailand, using sequencing of four loci (two tRNA-linked STR loci, chitinase, and SREHP). The high level of diversity reported from different geographic locations suggest that the rapid generation of new Entamoeba variants is taking place. The occurrence of new E. histolytica and E. moshkovskii genotypes in the area of Puducherry, India, may be a unique finding and the close relationship of these genotypes with a recognized human pathogen like E. histolytica should prompt further studies. In this study, the presence of mutations was explored in a region of 16S-like rRNA gene of E. histolytica, E. dispar and E. moshkovskii by applying riboprinting and SSCP analysis. Further studies are needed to extend mutation detection to the complete ribosomal RNA gene of these species, which will possibly reveal much more about genetic variation in Entamoeba. The present study has revealed the subsistence of mutation in ribosomal RNA gene of E. histolytica and E. moshkovskii, which points towards the existence of intra-species genetic variation in E. histolytica and E. moshkovskii isolates infecting humans. Subhash Chandra Parija and Krishna Khairnar contributed equally to this work. We are grateful to Dr. C. Graham Clark from London School of Hygiene and Tropical Medicine for providing us with lyophilized DNA of standard cultures of E. histolytica HM-1:IMSS, E. dispar SAW760, and E. moshkovskii Laredo. SCP supervised and coordinated the study, and helped to draft the manuscript. KK carried out the experimental work, and drafted the manuscript.